During his 35 years in the title insurance industry, Mel acquired a vast knowledge of Contra Costa County's building and real estate industry, and an exceptional record of public service. For 14 years at the beginning of his career, Mel was the only title insurance sales person serving subdivision builders in four counties. Today, four people are doing the job that Mel once did. 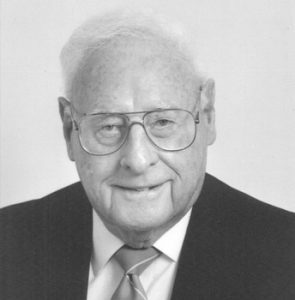 Throughout his career, Mel has held executive positions in the region's major title insurance companies: Financial Title Company, Title Insurance and Trust Company (TICOR), and First American Title Guaranty Company in Concord -where, at age 88, Mel currently enjoys an active professional life as senior vice president in charge of subdivisions. Putting his decades of knowledge to good work, Mel pioneered a streamlined way to process title insurance that increases the speed and efficiency with which new home sales are closed, enabling home buyers to move in more quickly and improving cash flow for builders. At First American Title Insurance Company, Mel created a "Central Close Department" devoted to closing sales only on new homes. "When resale and new homes were being closed by the same escrow officers, it was hurting new homes," Mel says. To break the bottleneck, he assigned escrow officers to work directly with new home builders. "By becoming an arm of the builder's business, we also became number one in the Bay Area for closing new home sales," Mel says. Several other companies have adopted Mel's idea, earning him recognition within the insurance industry as "the father of the modern, high-service title company." Overall, Mel believes that Contra Costa's remarkable growth has been good for the county. "We've had an influx of people with good salaries. Even through housing prices are high, they seem to be selling," he says, predicting that sales will continue to be strong in 1999, if interest rates remain stable. "I think the benefits of growth outweigh the problems." Mel has done more than his share to tackle the problems of growth, serving on Contra Costa County's Board of Supervisors for eight years. "Being on the Board of Supervisors was like going back to college," he says. Among other accomplishments as Supervisor, Mel was named "Watchdog of the Delta" for his lobbying efforts in Sacramento and Washington, D.C., to secure Contra Costa's water supply. He is particularly satisfied with his success in preventing agricultural runoff from being dumped into the Sacramento River at Martinez. "Instead, the ag chemicals went to Los Banos and we've all seen what happened there," he says. Mel also was instrumental in convincing the East Bay Municipal Utility District to open for recreation its reservoirs at Lafayette and San Pablo dams. ​Mel credits the building industry with helping Contra Costa County develop strategies to mitigate the impacts of growth. "The building industry was a real resource. They sent us the right people to work on the county's problems," says Mel, who believes the industry is not well understood by the general public. "People complain about the cost of housing, but politicians put fees on new homes and people don't realize that," he notes. "In some places, builders pay $50,000 in fees to build a house. The building industry is constantly trying to find ways to hold down fees and relieve the burden on home buyers."